Join us Thursday, August 23rd from 3pm-7pm to meet with VIP guests, get in on special deals, enter our prize drawing, and more! David Bock, founder, owner and chief engineer of Bock Audio, is a long-time studio tech by trade. Before launching Bock Audio in 2007, David was the chief tech at Ocean Way, Hyde Street and Hit Factory during the heydey that was the 80's and 90's. After gaining years of experience in maintaining, repairing, and modifying mics, David went on to build his own brand, developing the idea of “new vintage microphone production” in the process. 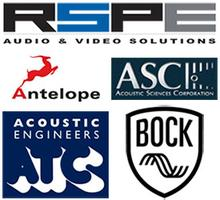 Pro audio vet Brad Lunde (TransAudio Group) has been ATC’s US distributor for several years. Brad has undergone extensive factory training and speaks enthusiastically about this incredible line of speakers, each of which is still individually handmade today. If you’ve ever wondered what makes ATC different, stop by and learn everything there is to know! Art Noxon brings over 30 years of professional acoustic design to the products that we will be showing at the evening's event. Art's unique experience and knowledge will provide our audience with amazing, practical and moderately priced solutions for nearly every studio and recording environment. A state-of-the-art solution that’s flexible, portable and revolutionary! We'll also be featuring the latest from Antelope Audio!